I had the pleasure of reading Poems for Lonely Prophets (Green Ivy Publishers, Illinois, 2016), a collection of ninety-two free verse poems by Ron Faust sprinkled with a sampling of his haiku from a previous collection of poems that marked the seventieth anniversary of the atomic bombing of Japan. The volume is 123 pages in length and includes a prologue by the author. One of the poems, “Lost Cap,” was first published in Songs of Eretz Poetry Review http://eretzsongs.blogspot.com/2015/11/poem-of-day-lost-cap-by-ron-faust.html; it is difficult to say how many (if any) of the other poems in the collection are reprints as there is no acknowledgment section. The book is available in trade paperback from Green Ivy Publishers for nine dollars http://www.greenivybooks.com/index.php/featured-authors/f/ron-faust.html. Ron Faust describes himself as “a retired minister-sailor-poet-activist.” He holds a doctorate from Drew University and attended Christian Theological Seminary. He is a supporter of PeaceWorks, American Friends Service Committee, and Disciples of Peace Fellowships in Kansas City. A staunch peace activist and anti-nuclear weapons protestor, he is proud of being arrested for “crossing the line” at Creech Air Force Base. 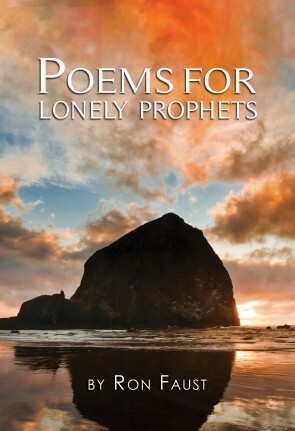 Poems for Lonely Prophets is the fourth in a series of prophetic poetry by Dr. Faust. The work in this most recent collection focuses on what the author describes as “a wide range of resistant poems about nuclear weapons, drones, and violence. It describes occasions through 2013 and 2015 when people were arrested for their high ideals about a non-violent world.” The poems are a prophetic warning that if humanity does not find a way to coexist peacefully and safely, then we will inevitably destroy ourselves. Faust rejects the mantra of peace through strength or peace through war and urges his readers to take the time and make the effort to find another way. Dr. Faust admits in “Welcome to the Table” that accepting those we find unacceptable (or these days, “deplorable”) would be a real challenge even for him, and I admire him greatly for having the courage to admit that. Faust rejects nationalism and the notion of American exceptionalism as contrary to his goal of peace, a position he expresses simply and effectively in “Blind Patriotism.” The extreme to which he is willing to go in order to achieve peace is eloquently but shockingly and starkly expressed in “Postscript to No Harm Done,” where he poetically states that it is better to die a violent death than to raise the “excuse” of self defense to justify a violent response. Taken ad absurdum, this would leave only violent felons alive, but one does have to admire Faust’s commitment to his cause. What I enjoy the most about Faust’s poems is their simplicity of language and straightforward if often misguided logic. When I disagree with the premise of one of his poems, which I’m afraid I most often do, I feel that I at least have a better understanding of from where the “other side” is coming, and that I might be able to have a peaceful, civil, and rational discussion with the guy about the topic, say over a pint. Leaving the haiku aside, which are unfortunately not the best examples of Faust’s poetic prowess, only a few of the poems in the volume really made me angry. The most blatant example is “Slaughterhouse 2014 Returned,” a poem that insulted me to my core and filled me with rancor for the author. This poem, which equates the actions of the Israeli Defense Force against the Palestinians in Gaza to those of the Nazis against the Jews demonstrates a dangerously careless naïveté at best or a disturbing penchant for anti-Semitism at worst. I do hope it is the former rather than the latter. Another disappointment is “Overkill” which gives credence to the now thoroughly debunked “Hands up! Don’t shoot!” fiasco in Ferguson, Missouri, which led to violent riots and not to peaceful demonstrations against what turned out to be the justified use of force by police. Many of my favorite poems call out the hypocrisy of churchgoers and religion. “Mad Mindlessness” and “Masquerade” and “Milquetoast Religion” observe that many “religious” people focus on good behavior, often feigned, as their tickets to heaven rather than that on which they should focus, namely actually doing good deeds and actively promoting universal peace and brotherhood. “The Hypocrisy of Being Too Nice” brings this theme to the family, pointing out that even family members are afraid to engage each other in the debate that must take place if we are to achieve the goal of a lasting peace. Poems for Lonely Prophets could teach much to both extremes of the political spectrum. The left could learn that responding with violence, vitriol, and mindless name-calling to the opposition simply will not advance the cause for peace that they purport to hold so dear. The right could gain insight (as I have from reading this collection, although I consider myself to be a centrist) into the thought processes of the left--an opportunity that unfortunately the left’s insistence on stridency and intimidation have heretofore not allowed. A thoughtful and careful read of Poems for Lonely Prophets could therefore actually bring all sides closer together and actually advance the cause for peace. And, as Dr. Faust preaches, that common ground does exist. After all, no one wants a lasting peace more than a soldier.